Website design home improvement contractors | When Conklin Gutters launched their business, they were referred to VISIONEFX by reputable other builders in Hampton Roads. Since 2010 the Conklin Gutters website continues to attract leads for new business and customers online. 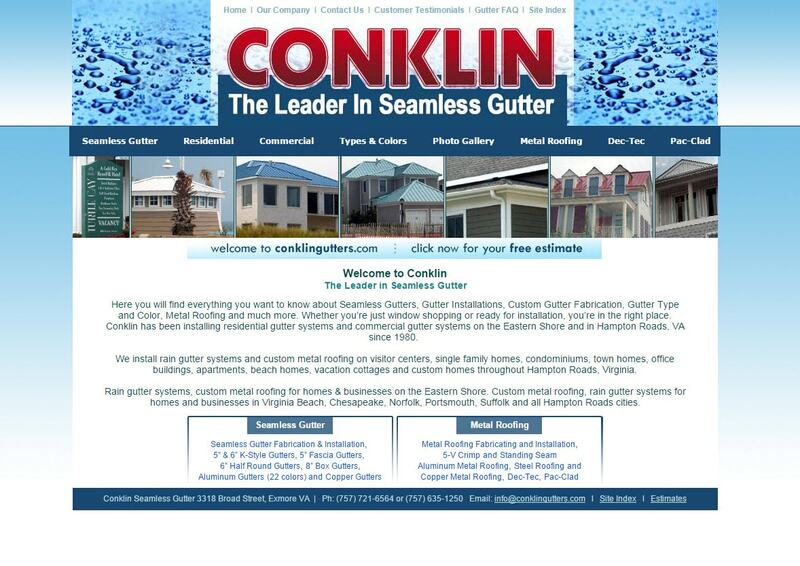 Conklin Seamless Gutters has offices and facilities located in Virginia Beach, VA. When searching Web Design Va Beach, Hampton Roads VA look no further than the web design experts at VISIONEFX. VISIONEFX, a Web design company based in Virginia Beach, VA provides extraordinary web design for small and large businesses throughout the United States to include; custom web design, web development, e-commerce web design, Word Press web design, Joomla web development, SEO and web maintenance services. Call: (757) 619-6456 or email info@visionefx.net.